In the heart of the Shining Rock Wilderness, high atop the Great Balsam Mountains, stands a peak of other-worldly beauty. Locals consider Shining Rock to be the “crown jewel” of the Appalachians. An elaborate network of Quartzite Rock formations adorn the summit and dazzle the eyes of the beholder. These “crystalline cliffs” peak through the canopy of a rich coniferous forest creating view-points of heavenly proportions. Several iconic trails, from varying trailheads, can provide access to this wonderland. If you desire an eye-pleasing adventure, embark on a vigorous day hike, or plan an overnighter, to come to enjoy the splendors of Shining Rock. The most picturesque route to Shining Rock involves a section of the Art Loeb Trail which traverses a string of mountaintop “grassy balds.” The start of this adventure begins from the Black Balsam Knob trailhead on road 816 off of the Blue Ridge Parkway. 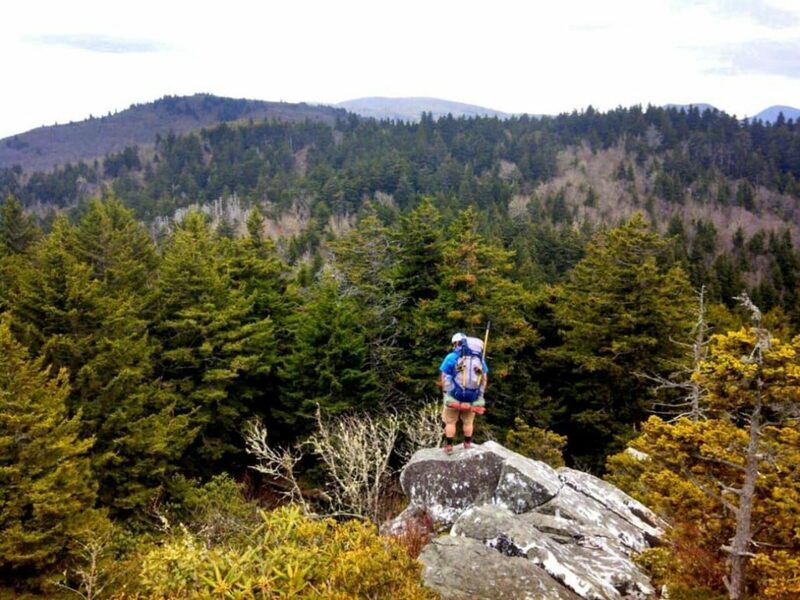 Heading north and following the white blaze of The Art Loeb Trail hikers will enjoy a five-mile ridgeline hike with long range views and fascinating flora. The first section of trail summits both Black Balsam and Tennent Mountain before dropping into Ivestor Gap. A traverse around Grassy Cove Top leads to Flower Gap, a strikingly beautiful campsite, and then on towards Shining Rock Gap. A consistent water source gurgles from the mountain just before reaching Shining Rock Gap. The water runs clear and cold but filtration is still suggested. A variety of quality campsites for tents and hammocks are dispersed under the rhododendron canopy at Shining Rock Gap. Just north of Shining Rock Gap lies a network of unmarked trails that lead to the actual summit of Shining Rock. Exploring several of these trails is a worthwhile endeavor as each leads to its own wonderful scramble and viewpoint atop the quartzite formations. A sunny day atop these shining rocks is an experience everyone should have in their life. Reflections of light and picturesque views amongst the canopy of a fragrant evergreen forest make this mountaintop experience feel heavenly. Another popular route to Shining Rock begins at the Big East Fork Trailhead and uses the Shining Creek Trail to gain the ridgeline at Shining Rock Gap. This route follows a pristine wilderness creek and climbs 3,000’ vertical to reach Shining Rock Gap. If you are looking for a full day, leg burner, of a hike; access Shining Rock from the northern terminus of the Art Loeb Trail at Camp Daniel Boone. On this rigorous section of trail, hikers will climb up to deep gap, below Cold Mountain, then traverse “The Narrows” section of The Art Loeb Trail on their way to Shining Rock. View seekers are in for a treat on this ridgeline hike. Nearly every step of the trail has access to long range views. Flowering plants on the grassy balds make late spring and early summer a beautiful time to visit for nature lovers. Fall colors and ripe blueberries highlight early autumn atop the Great Balsam Mountains. Stargazers will love visiting Shining Rock for an up-close view of astrological events. The remote location, lack of ambient light and high altitude at Shining Rock make this place a great venue for seeing the shows of the universe. The Quartz rocks on the summit create some dazzling light shows ideal for photographs. Plan your visit to coincide with a full moon and watch shining rock glimmer in the glow of the moon. Getting to the Black Balsam trailhead from Asheville involves a picturesque drive on the Blue Ridge Parkway. The area is very dog-friendly and no fees or permits are required to hike or camp at Shining Rock. The Shining Rock Wilderness is subject to some special regulations given its Wilderness designation, make sure to follow the special guidelines to ensure a wilderness opportunity for future visitors.